Almost 3 years ago I wrote an article for my school newspaper about arranged marriages because it was a topic that interested me. My parents are a product of arranged marriages and have been married for such a long time now. It got me to thinking about whether or not the either notion of marrying someone for love was more ridiculous than marrying someone for practicality. When I first wrote that article 3 years ago my intention was to first just show that arranged marriages still existed and then show that sometimes they could be more effective than love marriages. But now as a college student I find myself taking a completely new take on the issue. I think arranged marriages are more effective than love marriages and for many reasons. For one, in the past this was the way that most people married each other. People married for purpose or because of their current situation and this actually worked. Next this is currently working whereas divorce rates for love marriages have been sky rocketing. I’m reminded of a quote from my previous article. People are just too selfish to allow something like a marriage built out of love to work. People are passionate and the minute the spark dies, so does the devotion. What ever happened to loving someone in sickness and in health? What ever happened to people growing old and dying together? Instead people are so consumed with their own personal desires that marriages die in the process. I am in no way of form experienced in this topic. I’m not married nor do I intend to be married for a long time (Can we be real now, I’m eighteen years old!). But I grew up my entire life believing love should be one particular way not realizing how selfish this type of love really is. That’s the thing about love, love in and of itself is so selfless. Marriage should not be about fulfilling your own individual desires, it is something so much more sacred than that. 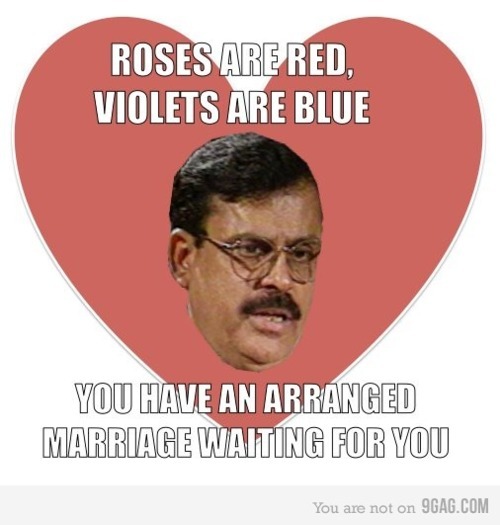 I always imagined arranged marriages were forced and deprived people. I grew up thinking that there is no way you can love someone in a marriage if you were arranged to marry them. Holding unto this idea that everyone in the world has one person who is perfect for them. Their other half who holds everything they could ever want in an another person. But human beings are not made like that. Human beings are born sinful and selfish. I remember trying to argue against that idea with a friend of mine, but I couldn’t. Face it. Human beings are selfish, we may do kind things but because it makes us feel good. And because human beings are like this, the idea of one perfect person out there is insane. No one will fit perfectly in the mold of perfection that you may want them to be. And trying to make someone into something they are not is cruel. Maybe marrying someone who isn’t “perfect” but actually wants the same things in life as you is practical and maybe being practical is smart. I’m only eighteen years old and have so much to learn in life, I don’t want to believe that love and being practical should mix. But marriage and passion can never work because passion dies out and I don’t believe that you can ever really stop loving someone. So maybe the idea of passionate love that fades isn’t right? In a world where people divorce left and right the sanctity of marriage is just left out to dry, but this does not mean that it is no longer important. Before you judge something like arranged marriages, give it another look.